Rev. and enl. ed. of the author's "Practical massage in twenty lessons", with many additions. With 68 original illustrations, including several full-page half-tone plates. 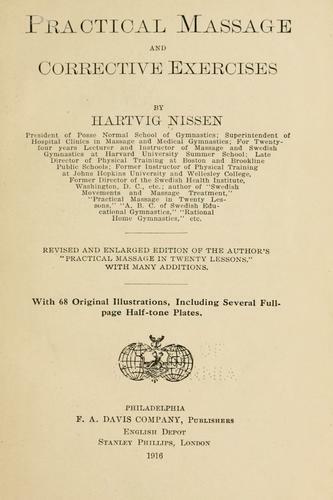 of "Practical massage and corrective exercises". The Free Books Online service executes searching for the e-book "Practical massage and corrective exercises" to provide you with the opportunity to download it for free. Click the appropriate button to start searching the book to get it in the format you are interested in.